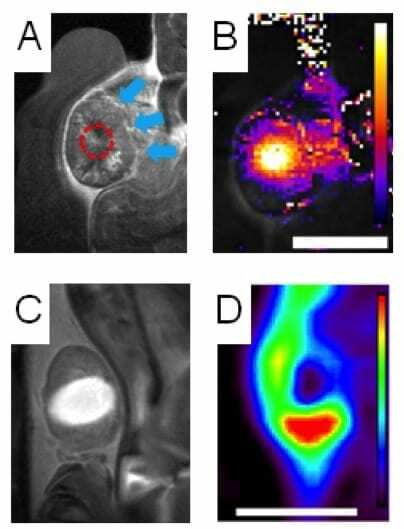 Clockwise from top left: Tumor (blue arrows) heated with ultrasound (red dashed line); heat map of tumor during treatment; PET scan shows nanoparticles in surviving tumor margin; bright contrast agent shows area damaged by heat. UC Davis image. Thermal ablation with magnetic resonance–guided focused ultrasound surgery (MRgFUS) is a noninvasive technique for treating fibroids and cancer. New research from UC Davis shows that combining the technique with chemotherapy can allow complete destruction of tumors in mice. In a new paper in The Journal of Clinical Investigation, Katherine W. Ferrara, distinguished professor of biomedical engineering at UC Davis, and colleagues report on a strategy that can destroy an entire tumor without thermal destruction of the tumor margin. Her group demonstrated a dramatic increase in the concentration of anti-cancer chemotherapy within several types of MRgFUS thermal ablation-treated tumors. “MRgFUS is already FDA approved for the treatment of uterine fibroids and palliation of bone metastases. We hope to expand the indication for MRgFUS by supplementing it with chemotherapy,” said first author Andrew Wong, a graduate student with the UC Davis Physician Scientist Training Program. Ferrara’s previous research has shown that ultrasound-induced mild hyperthermia can enhance the accumulation of tiny nanoparticles carrying anti-cancer drugs, but the accumulation is dependent on the type of tumor. Her group hypothesized that combining thermal ablation and chemotherapy could improve efficacy across multiple types of tumors. Ferrara’s research team found that the enhanced drug accumulation induced by MRgFUS resulted in improved survival and a consistent cure in their preclinical model of breast cancer, even when part of the tumor was left intact. March 22, 2019 - Ultrasonic Tissue Ablation System Market Forecast & Opportunities 2019 | Ethicon, Inc. ,Johnson & Johnson ,Misonix Inc. ,SonaCare Medical Spot HerldnThe report is a brilliant presentation of a highly detailed, comprehensive, and accurate research study on the Global Ultrasonic Tissue Ablation System Market.